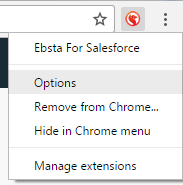 To stop the Ebsta for Salesforce Notification Bar appearing in Gmail and Linkedin you can chose to disable it by following the instructions below. 1. Right-click on the Ebsta button in the top right-hand corner in Chrome and select Options. 2. Check the Switch the Bar off in Gmail/Linkedin box and click Save Options. 3. You will need to reload Gmail/Linkedin so that your new settings take effect.